SOLO Taxonomy is a systematic way of describing how a learner’s understanding develops from simple to complex when learning different subjects or tasks. 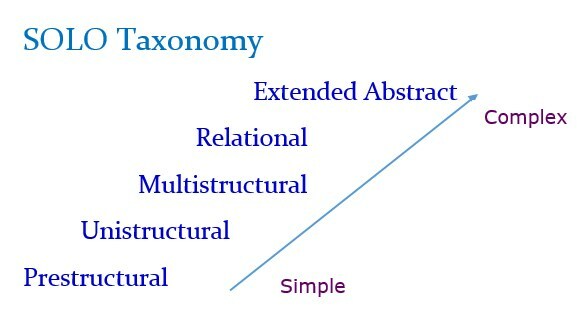 The SOLO Taxonomy (Structure of Observed Learning Outcomes) was devised by Biggs and Collis in 1982 as an alternative to Bloom’s (Cognitive Domain) Taxonomy. Bloom’s Taxonomy has been used for several decades to develop learning and teaching strategies. Bloom’s categorizes learning from simply remembering to more complex cognitive structures such as analyzing and evaluating. Through their work, Biggs and Collis looked at the Structure of the Observed Learning Outcomes produced by learners in terms of complexity. Their model describes levels of increasing complexity in a learner’s understanding of subjects or performance tasks. The SOLO model consists of the following five hierarchical levels of understanding that range from incompetence to expertise. At this level, the learner is simply acquiring bits of unconnected information. It has no organization and does not make sense to them. The learner does not understood the information, therefore, cannot demonstrate understanding. The learner’s response shows they have missed the point of the information. At this level, the learner has only a basic concept about the subject or task. They are able to make simple and obvious connections, but the broader significance of the information is not understood. The learner’s response demonstrates a concrete understanding of the topic, but it only focuses on one relevant aspect. At this level, the learner can understand several aspects of the subject or task, but its relationship to each other and to the whole remains separated. Ideas and concepts around a topic are not connected. The learner can make a number of connections, but the significance of the whole is not understood. The learner’s response focuses on some relevant aspects, but they are treated independently. At this level, the learner is able to understand the significance of the parts in relation to the whole. Ideas and concepts are linked, and they provide a coherent understanding of the whole. The learner’s response demonstrates an understanding of the topic by being able to join all the parts together. They are able to show how the parts contribute to the whole. At this level, the learner is able to make connections not only within the given subject field, but also make connections beyond it. They are able to generalize and transfer the principles and concepts from one subject area into a new and different domain. The learner’s response demonstrates they are able to conceptualize at a level that extends beyond what has been taught. They are able to create new ideas and concepts based on their understanding of the subject or task being taught. The SOLO taxonomy lists verbs associated with learning outcomes at each level.